Cherry and Spoon: Minnesota Fringe Festival 2018: "MEDUSA"
Summary: A retelling of the Medusa myth using dance, movement, original music, and fire. Highlights: Yes, I said fire. The dance company Vox Medusa combines their talents with those of Infiamatti FireCircus to create something unlike anything I have seen before. Performed outdoors in Logan Park in Northeast Minneapolis, the performance feels larger than life. A handy summary in the program tells us the general story of Medusa (she's not just an ugly woman with snakes for hair who turns men to stone, far from it), which helps set the stage so we can just sit back and let the show flow over us. It starts as beautiful flowing dance (choreographed by Julie Marie Muskat, who also performs the role of young Medusa), and then turns darker as Medusa's story grows darker. That's when the fire comes in. Members of Infiammati FireCircus carry big fires on the end of long poles, or small fires on short sticks, or swinging fire on chains, or wear it like a crown around their heads. 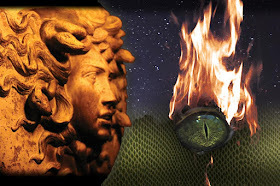 They fight Perseus who is after Medusa's head, swinging their fire against his shield. Original music (composed by Jeremy Christensen and Dylan Nau, with lyrics written and sung in Latin by Emily Colay, the fierce gorgon Medusa, and also sung by Nicole Collins as Athena) is projected from large speakers so that it fills the vast outdoor space. As if that's not enough, there are also some cool video and lighting effects. Truly, words fail in describing this unique and mesmerizing creation. Their first two shows were rained out so let's all cross our fingers for a dry weekend so you can go see them Friday through Sunday at 8:30!